I’ve been pregnant ten times. I’ve delivered five babies by C-section, one naturally and a stillborn daughter after 26 hours of labor. I have also had three additional miscarriages. My body has gained and lost nearly 250 pounds collectively, I’ve nursed each baby for a minimum of one year and I’m now nursing our adopted son…which means I haven’t slept through the night in years! If anyone can empathize the toll motherhood takes on a body, I can promise you it is me. So while I’ve abandoned the idea that my abdominal skin will be as taught as it once was, I still remain committed to my fitness routine. I have made my physical and emotional health a priority. Accepting my baby pooch isn’t an excuse to eat poorly or stop exercising, it is understanding that bodies change as we age, they change after children. I can’t recapture what I once was but I’m determined to work graciously with what I have now. I admit that I’ll never be a meal prepper. I would like to be but my reality is that I cook for a family of nine where no one eats the same thing. Making one more large meal just for me isn’t going to happen. The thought of eating 3-4 day leftovers isn’t appealing either if I’m being honest. I’ll also never give up an entire food group, forgo Eggos for dinner on busy nights or think a gimmicky shake for lunch is enough for me. However, I do commit to my health and fitness by embracing these four strategies that work. Make time for you. This is the most important piece of advice you can take from this post! I schedule my workouts just like I schedule a parent conference, my hair appointment or a doctor’s appointment. I would normally not cancel a much needed highlight or a visit with my child’s teacher so I try not to cancel on myself. I have two children in high school, two in elementary school, two preschoolers, a baby at home and I work…I get what it means to “not have time." I look at my calendar every Sunday and choose a minimum of three fitness classes to attend for the week.… I then write them on our master schedule and work around those times. I prefer group classes because I can change up my workout, I will push myself further and my results have been better in a group. (I know many women don’t feel confident to join a group class because of their perceived body image. Please know that working on your health is one of the most respected things a woman can do for herself! I always am so proud of the women who feel out of shape but finish a class. Truly inspirational!) Lately, I’ve been going to to 5:30 am classes while my children sleep. Your body will get used to waking up early and there is nothing quite like checking yourself off the to do list before 6:30am! Nothing get interfere with your workouts for the rest of the day! My workout of choice is Pure Barre, especially their cardio class, Empower. I am not paid to say this, I do not receive money for it…I just feel like this is a class that has changed the shape of my body. It always works core, which has been really helpful for me, but also hard to work areas like upper inner thigh and saddlebags. It creates long lean muscles but best of all, it has given me the abs I wish I had when I was 21. If you don’t live near a Pure Barre, you can get their workouts on demand. You can also use one of these DVD’s (that I also have) if you need a home workout. While walking or hammering it out on the elliptical burns calories, you will NEVER CHANGE THE SHAPE OF YOUR BODY UNLESS YOU DO SOME RESISTANCE TRAINING. This means you have to use body weight, bands and/or light weights to change your shape and tone your body. If you hate your saddle bags, walking will not get rid of those but side legs lifts will. 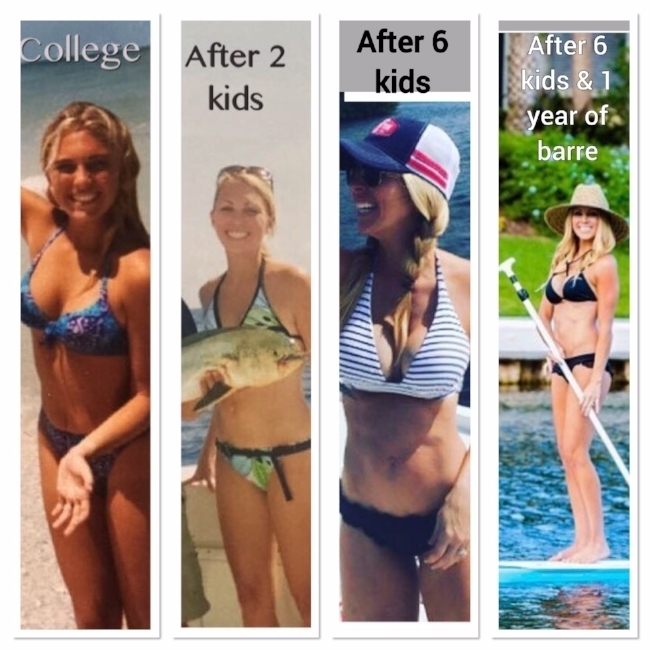 As you can see from the photos in this post, my best mom body came after all six babies and only after including cardio and my resistance training barre class. I also love any type of body sculpting class, dance class or kickboxing. The more lean muscle you build, the more calories you burn outside of exercise. 3. IF YOU CAN’T GET TO A GYM, DO HOME WORKOUTS. If you just can’t get to a gym, get in your workouts before the kids get up. I once worked three jobs as single mom, I understand all of the reasons why it sometimes just doesn’t happen. Schedule three 5:30 am workouts in your living room each week. I know how unappealing that sounds but once you start, you don’t want to give up on yourself. Create a library of DVDs, get Pure Barre or another workout ON DEMAND or join a program like Beach Body. My sister has four children under age four, including a special needs child, so she does not even have the gym daycare option…but she gets up at 5:30 am to finish her workout at home before her kids’ feet even hit the floor. If you want to feel and look better, you have to commit to it. Resistance Bands - I use these for everything. These are great for thighs and legs. Stability Ball - My favorite way to do abs at home. So many options. Light weight set - You will not tone your arms without body weight or light weights. 4. MAKE SMARTER DIET CHOICES. Eat in moderation. I eat everything but I eat it in moderation and in small portions. If I want pizza, I’ll have once piece and a salad. If we’re eating out, I order off the kid’s menu or ask for the lunch portion. Stop eating three pieces of pizza or double cheeseburgers…be reasonable in your portions. Juices, sodas, fancy coffees and alcohol add a TON of added calories to your diet. This can add HUNDREDS of extra calories a day. I try to drink one class of orange juice in the morning and water the rest of the day. I don’t drink coffee or wine (freakishly weird I know) because I just don’t like the effects of either of those in my body. I always eat peanut butter and banana sandwiches (reduced fat Jif and wheat toast) for either breakfast or lunch. It has carbs to fuel me, protein so I don’t have a sugar crash and fruit. I also love eggs and omelettes..I also eat these for one meal a day, including lunch and dinner. Cottage cheese with pineapple and toast, salads, caprese salads or breads… these are things I eat weekly. I try to avoid starchy carbs, like big plates of pasta for dinner, opting to eat those carbs earlier in my day so that I can burn them off. I don’t eliminate any food groups. I just feel that this isn’t a lifestyle I can maintain and it sets me up for failure. Everything in moderation. I backload a lot of my carbs meaning I try to avoid plates of pasta in the evenings and save those things for lunch. Use this microwave omelette maker if you like eggs! It has made eating eggs to much easier and its only $6! I love Stack’d Protein pancakes. They comes in many flavors but I like the buttermilk because they taste like Bisquick pancakes. I eat these for lunch with bananas and it fills me up because they are packed with protein. I like making smoothies with non fat vanilla yogurt, strawberries and bananas in this countertop Ninja blender. Unless my husband grills, I make lean ground beef burgers on this little countertop grill. You don’t have to be a size 4 to be the best version of you! Start to enjoy taking care of yourself and the feeling that accompanies getting healthy. Your children, your work, the husband that says he doesn’t know how to go to the grocery store with children (or is that just mine) are the REASONS to work out, NOT the excuses. Success doesn’t come from what you do occasionally, it comes from what you do consistently! Commit to your best mom body because taking care you is part of taking care of your family! After one year of my "bikini barre" and resistance training.